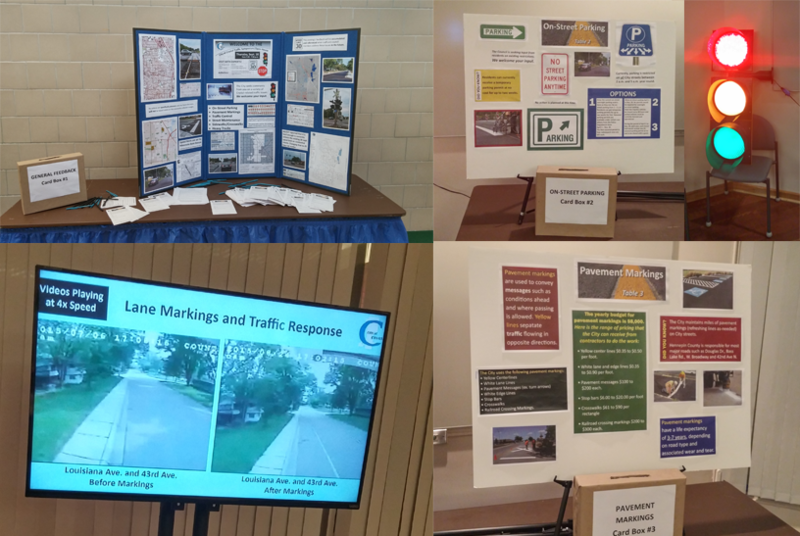 On September 10, 2015, the City of Crystal hosted our first Traffic Symposium. The event was a part of the earlier announced Citizens Connection Initiative, and came about due to the high volume of concerns about traffic that council members receive. The idea was to gather concerns citywide so we could develop a holistic approach to addressing traffic concerns in the city, rather than a piecemeal approach. At the event there were several “stations” which covered different areas of the traffic system such as Street Maintenance, Signs, and Traffic Control devices. Each station had a corresponding feedback sheet that allowed residents to give feedback about the specific topic. The city staff also created two videos to help put traffic volumes in context, which were quite interesting. At the city council work session this week, the council discussed that we would like to get the materials from the event online so that we can expand the amount of feedback we receive, and share the great materials with residents who were unable to attend. The hope is we will be able to get the survey portion online so people can provide feedback with a few clicks. I will post a link to those materials with a more detailed recap as soon as they are available.